The missal presents texts for the celebration of the Mass. Most of the Mass remains constant throughout the year, but within it are read and sung texts which are unique to each day of the calendar, some of them from the Bible, some special hymns and prayers. This missal was produced in the 14th century for use in Hereford Cathedral. The mass that it presents was meant for a lay congregation as opposed to a monastery. Although by the 14th century much of the Mass was standardised, still it could vary from place to place. This manuscript can be identified as being of 'Hereford use' by the kinds of texts in it, the way they are arranged, and the saints whose feast days are 'red letter,' that is, written in red. The simple ornament of vines and leaves, drawn in coloured inks, is typical of missals made for everyday use in the later Middle Ages. 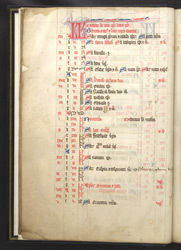 This page, from near the beginning of the missal, shows the calendar of saints' feasts for October and November. The abbreviation for calendar (spelled 'Kalendar,' 'KL') in the upper left is followed by a note that it covers thirty days and nights. The red letter days include St Thomas (Bishop) of Hereford, St Luke the evangelist, and the Apostles Simon and Jude. The modern expression, 'red letter day,' comes from the medieval practice of using red to write important feast days in the calendars of church books.